This image is attributed to Mary Samuel with a 1944 date. The note says this is ice storm damage, but it looks to me like there is also fire damage. I suspect they were putting out a fire during a hard freeze. That's the Hotel Waucoma (River City) next door. Right on Arthur about a fire.....most likely started in the pool hall/cigar shop based on the damaged area. May Samuel was a sister to Ray Samuel and an aunt to Elwood "Tweet"
This is along in there where Marchbanks was located and now the Chinese restuarant. Does look quite chilling at that. Is that the Rotary symbol? If it is that would indicate that maybe that is where they met, in the upper story. I remember a door between Marchbank's and the Chinese restaurant that led downstairs to the American Legion. Timely post, with the Kayak Shed downtown having just burned down, and Underwood Fruit Company ablaze in Bingen as I type. Yep. 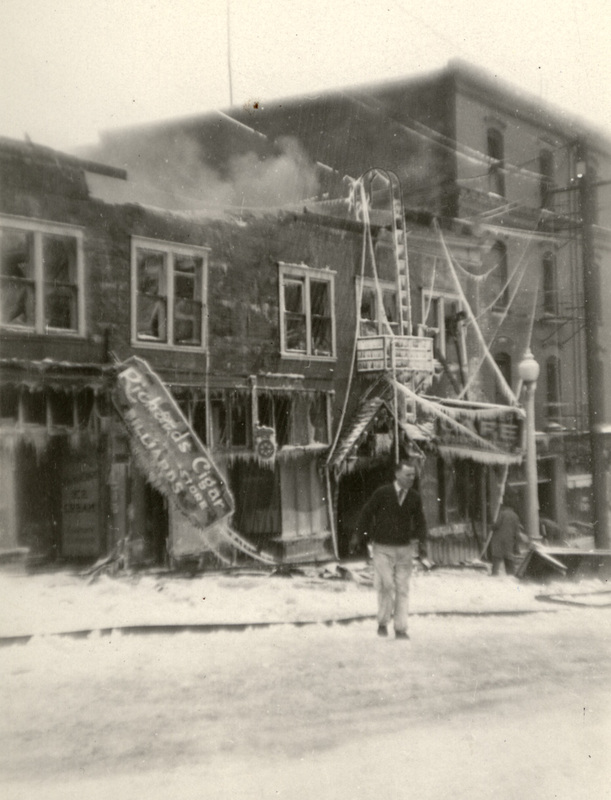 I was just reading about the Underwood Fruit Co. fire and then come over to HHR and see a photo of fire damage. I wonder what the outside temperature was. I think Charlott is correct about that being the Rotary symbol. FYI I usually queue up image a week to a year in advance, so the timing of this is coincidental. I think I'll queue up some pictures of butterflies and puppy dogs for next week to see if it brings us happier times. Was this perhaps the end of the Pheasant Cafe ? Can anyone make out the cafe sign ? I looked up Richards Cigar and came up with this. Perhaps not the same. Was there a bowling alley in the basement of this building? In the Dec. 31, 1908 HR Glacier: Chas Richards, who has been employed in the cigar store and confectionery for some time owned by Carl Ross has bought an interest in the business and the store will be run in future under the firm name of Ross & Richards. The bowling alleys in connection with the cigar and confectionery store of Ross & Richards have been put in fine shape for the bowling contest…..
Oct. 13, 1910 HR Glacier: C.A. Richards & Co. Occupy New Room——The east room of the new Judd Fergusson building is being occupied this week by C.A. Richards & Company with their newly equipped tobacco store ad billiard parlors. The firm has been cramped in temporary quarters at Fourth and State….during the of the new building and the new location is well adapted to the uses…..The Richards firm has a lease on the entire building……the front will be open with folding doors and devoted to tobacco and confectionery….with a counter where oysters will be served in all styles during the winter…..A partition setting off the billiard room….From the front room is a stairway leading to the basement where bowling alleys will be put in…….On the second floor four office rooms have been built across the front and the back part is a hall 50 by 80 feet…….the whole building will be steam heated. C.A. Richards & Co. will soon close the bowling alleys in the basement of their big establishment at Hood River for the summer……..